Lori Riggins Photography: My favorite thing, that's not really mine! I regretted for a long time not choosing wedding china. I chose some dishes that were more practical, but then after I got married I would find myself drifting over in department stores and picking up cups and saucers and thinking how beautiful they would look on my table. Then, a few years ago, my mother-in-law decided to move to an apartment, and downsized her belongings, and she gave her beautiful Theodore Haviland "Apple Blossom" china to my young daughter. Well, I lost no time in getting a china cabinet to put it in! When Becca gets married someday I'm afraid I'm going to have a hard time parting with it! Settings for this shot were Av mode, f2.2, ss 1/100, ISO 400, 50mm lens. HHCC appreciated! 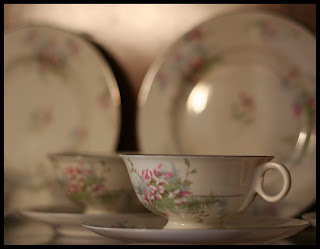 Beautiful set, Im sure it will be hard parting with it someday, when that time comes you can always replace it with another one, can't have an empty china hutch after all. Great shot. Beautiful china. I too would have a hard time parting with it. OK - I must be totally tired. I read that as "Sunday" and not someday... HAhahaha Oh my! Wow it is beautiful! I agree, I would brighten it a bit. Love your dof! Oh that's so great! I didn't get china for my wedding either, so maybe there's still hope for me. I like the angle and focus, would like to see it a little lighter/brighter maybe. Gorgeous pattern, so vintage looking! Having seen this set in person, this is a very good shot. Maybe a little more front lighting like some others have said but a great shot! Really captures the timelessness "feel" of the pieces.